Extraordinary events are the specialty of Rock-A-Hula®, Waikiki’s largest Hawaiian show. Combine hula and fire knife dancing with incredible rock ‘n roll performances and you’ll bring your next event to life in ways you can’t even imagine. Whether it’s in the daytime or evening, your attendees will be mesmerized and energized. Browse our selection of packages or contact our Events Department at (808) 983-7884 or events@rockahulahawaii.com and let us help you plan a rockin’ event! Let us plan the perfect evening event for your group. 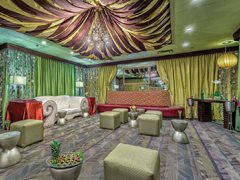 Our unique packages are designed for groups from 10 to over 1,000 guests. Make sure to ask about our custom enhancements, including awards ceremonies, use of our team of managers and technicians, transportation, leis, cakes, logo items and more. This truly is the ultimate private event, perfect for VIPs and awards ceremony dinners! The Royal Hawaiian Theater®, in the heart of Waikiki, is the perfect location for an epic gala. State-of-the-art light and sound, multimedia technology and 750 seats set the stage for your event. 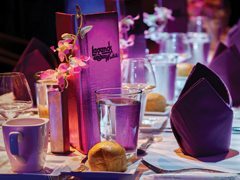 Gourmet 4-course dinner OR Gourmet buffet international dinner, super premium hosted bar with Pre-Set Bottles of Red and White Wines, the brand new Rock-A-Hula® show and the exciting Meet&Greet® with cast members add to the glitz and glamour. From $440 per person. Minimum 200 – maximum 300 guests. 5 1/2hours from 4:00 – 9:30PM. Feel like a celebrity! The Green Room® Event treats everyone in your party like a star. Gather in your private Green Room® for a program or to socialize, followed by an exclusive backstage tour. Then enjoy a 4-course Steak and Seafood dinner at the best tables in the stageside VIP area. The evening gets even better with the new Rock-A-Hula® show and the exciting Meet&Greet® with the cast afterwards. From $230 per person. Minimum 10 – maximum 50 guests. Perfect event for incentive groups. Use the impressive Royal Hawaiian Theater® stage for your private program and toast. Then, enjoy a delectable 4-course, Steak and Seafood Dinner. 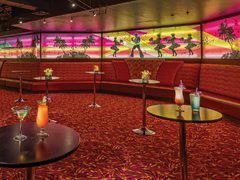 You’ll be settled into the best seats in the house in time for the spectacular Rock-A-Hula® show, followed by an exciting Meet&Greet® with the cast. From $154 per person. Minimum 120 – maximum 230 guests. When you first arrive in paradise, nothing says “Hawaii” like our Luau Event. Casual, fun and in the heart of Waikiki, our Luau has a treetop setting on our top deck outdoor terrace, with Hawaiian buffet, music and hula. Then, take in our dazzling Rock-A-Hula® show in Waikiki’s largest theater, followed by an exciting Meet&Greet® with the cast. From $114 per person. Minimum 100 – maximum 400 guests.